Wild harvested native Pepperberries are so delicious you will wonder how you managed without them. Hot and spicy with a chilli-like flavour these pepperberries are a lot of flavour to any meal. You can also mix with your regular black pepperberries if you want to soften the flavour a little. We grow our own trees and we know what we sell, and we do it using totally organic methods - no chemicals whatsoever, and no forest destruction. The Tasmanian Mountain Pepper tree (Tasmannia lanceolata) is an endemic shrub/tree to Tasmania, Australia. It can be found growing anywhere from sea level to alpine regions. As such, it tolerates frosts and requires moist soil. It also grows in full or partial sun. 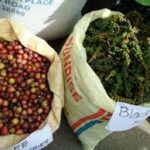 Male and female trees are needed to produce the hot spicy glossy deep-purple (almost black) pea-sized Pepper Berries which grow in clusters at the base of new season's growth. 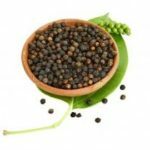 Both the Berry and the leaf are edible - the Berry being an alternative to traditional pepper but much more versatile, nutritious and extremely high in anti-oxidants, while the leaf is used similarly to curry leaf. Tasmannia lanceolata (syn. Drimys lanceolata), commonly known as the mountain pepper (Aus), orCornish pepper leaf (UK), is a shrub native to woodlands and cool temperate rainforest of south-eastern Australia. The shrub varies from 2 to 10 m high. The aromatic leaves are lanceolate to narrow-elliptic or oblanceolate, 4–12 cm long, and 0.7–2.0 cm wide, with a distinctly pale undersurface. Stems are quite red in colour. The small cream or white flowers appear in summer and are followed by black, globose, two-lobed berries 5–8 mm wide, which appear in autumn. There are separate male and female plants. Originally described by French botanist Jean Louis Marie Poiret, it gained its current name in 1969 by A.C. Smith. It had been known for many years as Drimys lanceolata. 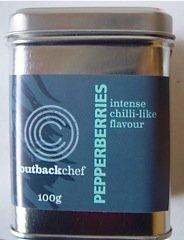 Also known as Tasmanian pepperberry, it is found from Tasmania, northwards through Victoria toBarrington Tops in New South Wales. It is found in gullies in rainforest. 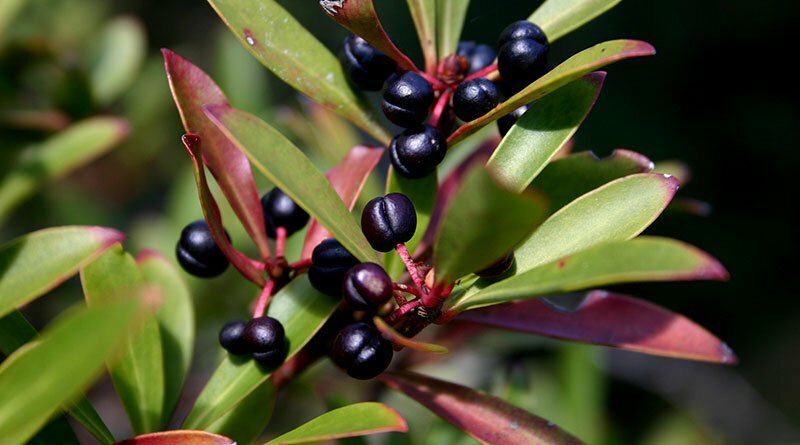 Polygodial has been identified as the primary active compound in Tasmannia lanceolata, and is also responsible for its peppery taste. The leaf and berry are used as a spice, typically dried. 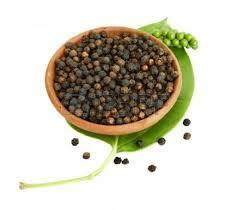 Mountain pepper was used as a colonial pepper substitute. More recently, it has become popularised as bushfood condiment. It can be added to curries, cheeses, and alcoholic beverages. It is exported to Japan to flavour wasabi. The berries are sweet at first with a peppery aftertaste. Dried T. lanceolata berries and leaves have strongantimicrobial activity against food spoilage organisms. 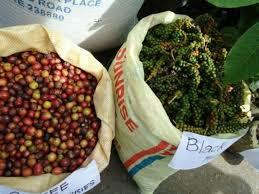 It also has high antioxidant activity. Low safroleclonal selections are grown in plantations for commercial use, as safrole is considered a low-risk toxin. Used in colonial medicine as a substitute for Winter's bark, a stomachic, it was also used for treatingscurvy. 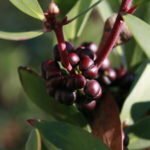 Mountain pepper is one of a number of native Australian herbs and food species being supported by the Australian Native Food Industry Ltd, which brings together producers of food species from all parts of Australia. The pepperberry can be used as a fish poison. It can be grown as a garden plant, and its berries attract birds. Currawongs are among those which feed on them. It can be propagated from cuttings or seed, and can grow in a well-drained acidic soil with some shade, but is sensitive to Phytophthora cinnamomi. Garden cultivars include 'Mt. Wellington', a compact plant with coppery new growth, and 'Suzette', a variegated cultivar.